Hewish church is a very small building known as a Chapel of Ease which was built in 1868 in Ham stone cut and squared, ashlar dressings with a plain clay tiled roof with bands of beaver-tail tiles, saw tooth ridge, and step coped end gables with cross finials. There are 4 hollow-chamfer mullioned windows, two to each flank wall, each with 3-lead lights. A simple porch on the east side of gothic revival and set above is a plain bell turret holding a single bell on a stepped coped gable. 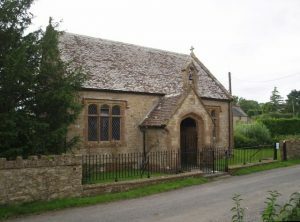 The interior is very simple, with arch-braced king post roof truss of 6 bays, simple pews and other fittings, including a C19 octagonal panelled stone font.The Church is located on the outskirts of Hewish in the heart of farming countryside. Services, 1st and 3rd Sunday for Holy Communion at 11:45, and every 2nd and 4th Sunday for Morning Prayer at 9am.